This good apple is often described as a “ray of sunshine” in the café each morning. From her homemade smoothies to the delicious custom creations she builds for staff members. She takes the time to get to know the students and help build healthy habits and independence. She welcomes each student with a smile as they work to remember their lunch pin number and, of course, their vegetable selection. When presented with a change in schedule this Good Apple replies with “no problem” we got this, and she always does. Staff and parents alike appreciates her genuine enthusiasm she brings each and every day. Yes, Jackie Burdick you are a Good Apple! This Good Apple is an integral member of the support staff that welcomes a challenge. The amount of knowledge that she is able to present in a clear and concise manner at parents meetings is impressive. At the same time, if an issue presents itself that needs further exploration, she is the first one digging deeper with an additional test or taking time to research progressive strategies that can meet a unique learner’s needs. The interaction and rapport she has with students is one of her most impressive qualities. Students are excited to attend sessions with her as she integrates technology and engaging activities, combined with high expectations. She has been a valued resource to all staff and her work ethic and professionalism are second to none. Cindy Driscoll you are a Good Apple! This Good Apple has one of the widest-ranging job descriptions. One staff member said “when I saw this job posting, I could not image who would want this job.” Luckily for EHHS this Good Apple did. Every day she wears multiple hats with cheerful regularity, doing everything from managing the district’s website and social media accounts, coordinating the 1:1 Chromebook initiative at EHHS, live-streaming Board of Education Meetings, supervising study hall students in the library. She is also very talented at repairing and re-shelving books and troubleshooting printers, projectors and laptops – all in addition to her enthusiastic work with the Prevention Council. In a job that demands many skills, one thing is very consistent: this Good Apple does it all with a smile everyday. Irene Kuck you are a Good Apple! Since joining EHHS in 2009, this good apple has worked tirelessly to make the Business Department great. She has aligned herself with other departments in order to connect her curriculum to other disciplines. She has designed curriculum for numerous new classes while integrating herself into the school, attending other department meetings and volunteering for numerous activities. She chaired NEASC Instruction committee, a standard that was commended by the visiting committee. She started the Business Club; this organization has donated countless items to the East Hampton Food Bank and to other charities, brought in guest speakers and given numerous students a chance to explore their future working in business. She teaches students about making smart financial decisions in every aspect of their lives and is giving them the gift and tools to have successful future. She really cares about her student and she makes a difference in each of their lives. EHHS is lucky to have her! Kristin Dean you are a Good Apple! This amazing Good Apple was nominated by three High School Students! They took the time to hand write beautiful sentiments for this nomination. Of course we all know, Lia Straub, you are a Good Apple! This Good Apple is a fantastic example of a lifelong learner constantly searching for ways to get better at her position. She personalizes her approach with each student ensures they meet with success. She uses her free time to go into classrooms to support all students. She has an incredible positive outlook and helps students believe in themselves and their ability to conquer their math challenges. She has a fantastic eye for data and her analysis of student data provides insight for all teachers to use in their instruction. Most impressive is her ability to building strong relationships with the students she teaches. It is not uncommon to walk by and see students enjoying their additional math support. She is a shining example of a strong advocate for children and indeed a good apple. Elaine Pellegrino, you are a Good Apple! Ensuring the safety of all students truly takes a village and the collaborative efforts of many. 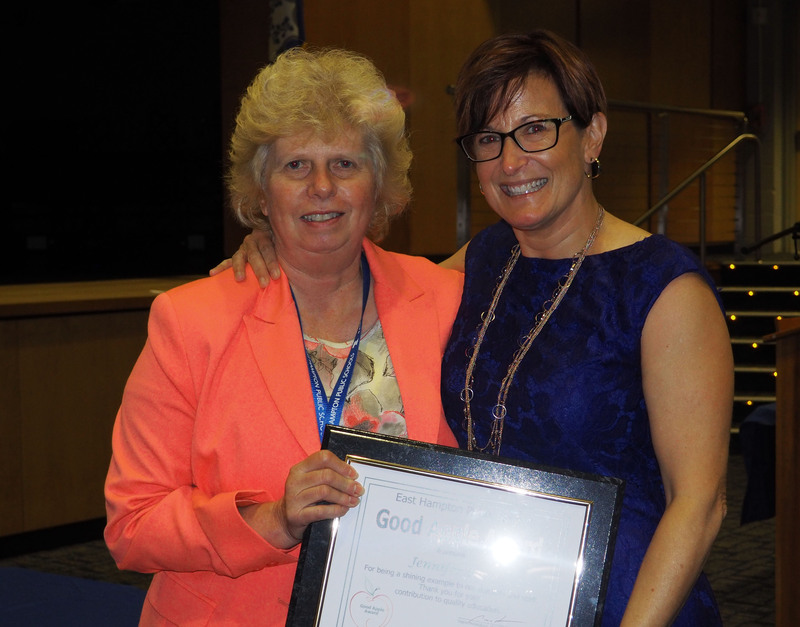 This good apple is recognized for her tireless behind-the-scenes efforts to do whatever it takes to ensure that 1,500 students get safety to and from school. She responds to bus challenges with kindness and caring. Her collaborative efforts have led to increased efficiency in Memorial’s dismissal process. With tremendous enthusiasm she supported and organized Memorial’s first annual “The Wave.” This fun event involved every staff member and students riding 16 buses. The honking horns, waving hands, smiling faces and cheers launched summer vacation. Though this good apple is moving on to other aspirations and will no longer be part of the district family, we wish her the best of luck! Ginarose Vlake you are a Good Apple! This Good Apple was nominated from eager Learning Center Students. He is a really caring and genuine person who brings energy and light to everyone at the Learning Center. He makes me feel comfortable and relaxed. When I first met him, he seemed interested in what I was working on. He engaged me in conversation and asked several questions. Next time I saw him, he remembered my name and asked how I was doing. It is special when an adult sits down and has a conversation with students – not necessarily about school. He takes the time to listen and does not judge. He has a youthful energy and a great sense of humor. He cares about the program, staff and the students. This Good Apple demonstrates impressive leadership qualities and a highly collaborative spirit. She welcomes a challenge and models the growth mindset & risk-taking that we expect of our students by engaging in new learning and translating it into action in her classroom. She is always reflective in order to adjust her instruction and best support her students. Whether organizing materials for her department, analyzing student achievement data for intervention services, or planning for assessment practices across the school this Good Apple approaches all tasks with a student-centered approach and a strong sense of collegiality and professionalism. In fact, this Good Apple embodies the qualities excellence both in an out of the classroom. She is kind and compassionate to her students and goes the extra mile to work with each and every student to ensure they get what they need. She is an active member of the school community and looks for opportunities to engage with her students away from the classroom – from community bike rides to school dances. Her recognition of the needs of the whole child is a hallmark of her classroom and her approach to teaching and learning. Katrina Aiken you are a Good Apple! This good apple many days travels to seven different schools in two districts! She is always positive, full of energy, and effervescently encouraging to our front line staff. Her passion and enthusiasm is contagious. She is active in elementary school PTO’s and has strengthened relationships in all buildings with administrators, teachers, and paras. Partnerships with university interns have been expanded and she has taken a leadership role in a new regionalized purchasing coop to lower prices and further improve food quality. All to better the lives of our students and staff through a high quality school nutrition program. Yes - Jen Bove you are a Good Apple! This Good Apple has received “The Order of the Cheetah” recognition multiple times in appreciation of his dedication to taking care of others and things. Staff appreciate returning to school each day to find the classrooms on his route expertly cleaned and ready for the next adventures in elementary learning. He is patient and teaches students to share the responsibility of taking care of things in our school, and in doing so, is a great example to young children. Parents have expressed gratitude for his efforts during evening events and he does not hesitate to stop what he is doing to lend a helping hand. This good apple will walk staff members out to their car at night. He is a true team player who goes above and beyond with kindness and caring. Ryan Duffy you are a Good Apple!